This package is for registered Hypnobirthing Australia™ Positive Caesarean Birth Course Participants Only. Course participants, please use your special voucher code to receive a 100% discount off your folio downloads at checkout. Your voucher will be given to you directly from your Certified Hypnobirthing Australia™ Caesarean Trained Practitioner. You will receive an invitation to join our secure ‘members only’ online learning platform to access, view and download the extra resources that accompany your Positive Caesarean Birth Folio. Please note that this email will come from hypnobubs™ and is titled ‘Your New hypnobubs™ Account’. 5. Access to the Birth Rehearsal (practical exercise) so you can practice the techniques you have learnt throughout the course, helping you to prepare for a very positive and empowered birth experience. 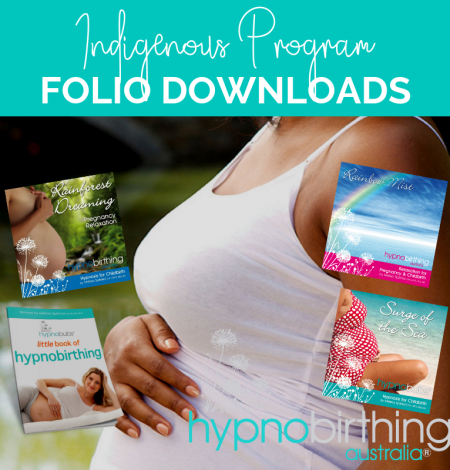 In addition to these albums and eBook, parents receive a comprehensive physical folio of resources at Hypnobirthing Australia™ classes offered by Certified Hypnobirthing Australia™ Caesarean Trained Practitioners only. This download package is only available to currently registered participants of a Hypnobirthing Australia™ Positive Caesarean Birth course. Hypnobirthing Australia™ Positive Caesarean Birth Course Participants: Please use your 100% discount voucher for this download (provided by your practitioner) at checkout. This email will contain your username and password, please follow the instructions to login to the site via the link provided. Important: This secure link will expire in 7 days – so please accept your invitation immediately. If you are an existing member you will receive an email granting you access to this course. Please use your existing email and password to login. The mp3 tracks that you will receive all incorporate the techniques of relaxation, breathing, visualisation and self-hypnosis to prepare your mind & body for a calm and positive caesarean birth. Deep relaxation and self-hypnosis have been shown to reduce the perception of pain, level of post-surgery medication required and also the length of recovery. The birth of your baby can and should be one of the most treasured times in your life. Prepare yourself to experience the joy! Melissa is a passionate advocate for natural birthing; but also recognises that sometimes the safest delivery for mother and baby is via c-section. In addition to being one of Australia’s most popular and recognised hypnobirthing instructors, she has pioneered this special course to prepare parents for Caesarean Birth which is receiving national and international acclaim. It is important that you do not listen to any of the tracks (apart from the affirmations) whilst operating a moving vehicle or when engaged in an activity that requires attention. Allow yourself to release any fears relating to your birth and positively anticipate the birth of your baby. Take some time out of your day, relax and enjoy this beautiful time as you bond with your baby and reprogram your subconscious mind for a calm and positive caesarean birth. Spoken word by Melissa Spilsted – Hypnobirthing Australia™. Music by Christopher Lloyd Clarke. Melissa is a certified Hypnobirthing Practitioner Childbirth Educator (HPCE), a registered Teacher (B.Ed, B.Arts), a Clinical Hypnotherapist (Clinical Member of the AHA), has written for Mother and Baby Magazine, appeared in Practical Parenting Magazine & The Australian Woman’s Weekly, lectured midwives and midwifery students in local universities and hospitals and her work has been showcased at the Royal Society of Medicine in London. Please also explore some of our other ‘Hypnobirthing Australia™’ titles for pregnancy, birth, breastfeeding, bonding and parenting.